Kinder Surprise eggs are prohibited from being mailed to the U.S. because the toy inside poses a choking hazard, according to the U.S. Consumer Product Safety Commission. WIESBADEN, Germany — People who are thinking of sending chocolate eggs stateside this Easter should be aware of the U.S. Customs regulation banning Kinder Surprise eggs from import to the U.S.
“U.S. 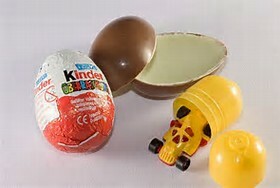 Customs and Border Protection agents will remove Kinder Surprise chocolate eggs from your baggage or any package mailed stateside,” said Tim Sellman of the U.S. European Command Customs Executive Agency. However, he added that other Kinder brand candy products can be mailed without restriction. For example, the Kinder Joy product is also egg-shaped but not banned. Those who ship Kinder Surprise eggs can be fined. Sellman stated that shippers have an obligation to declare items they are mailing on the customs declaration form to avoid penalties. Kinder Surprise chocolate eggs are popular treats all over Europe. The hollow chocolate eggs come in a colorful foil wrapper and contain an oval plastic capsule with a small toy inside. The Consumer Product Safety Commission tested many of the toys and determined they present a choking hazard for young children. The Food and Drug Administration also issued an import alert for Kinder Surprise eggs because they are confectionery products with an imbedded non-nutritive object. According to the Customs website, CBP seizes thousands of Kinder Surprise chocolate eggs each year at mail facilities and from individual travelers. By contrast, the Kinder Joy candy (or Kinder Merendero as it is known in Italy) is legal in the U.S. because the egg-shaped packaging splits into two. One half contains layers of cocoa and milk cream while the other contains a toy. Contact the local U.S. military customs office for more information or visit the FDA’s website.